Salman Khan Films' new venture, Notebook, is just around the corner. The hype around the movie is really good. The movie is the launchpad for two new faces in the industry, Pranutan Bahl and Zaheer Iqbal. A new promo featuring the latter has been released by the makers and it is a laugh riot. 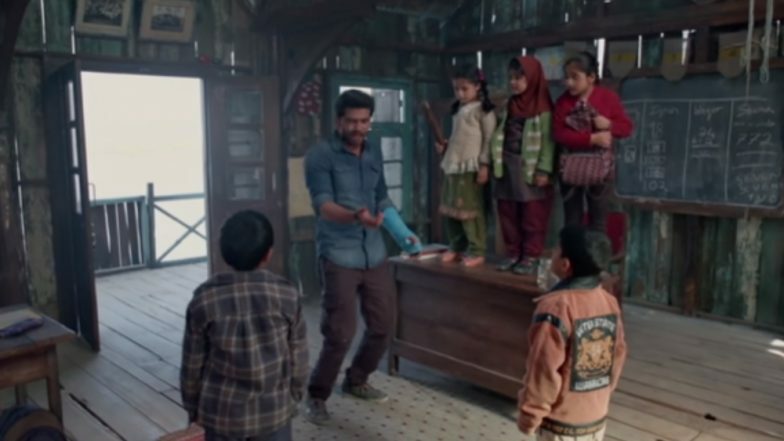 As we know from the trailer, Zaheer plays teacher to a few kids studying in a remote school in Kashmir. During one of his classes, a snake enters the room and everyone, including Zaheer and the kids, are scared. Notebook Song Main Taare: Salman Khan Describes Zaheer Iqbal and Pranutan Bahl's Extraordinary Love Story Perfectly - Watch Video. The kids ask Zaheer, the obvious adult in the room, to deal with the slithering intruder. The hero is scared himself but braves through the situation anyway, only to be bitten by the snake. And then he goes through a brilliant fit of overreacting to the situation. He even asks one of his students to slap him lest he falls asleep. The actor has done a good job and actually manages to be funny at that moment. Notebook BTS Video: We Need a Moment to Talk about Pranutan Bahl and Zaheer Iqbal’s Crackling Off-Screen Chemistry – Watch. If more cute moments like this one are there in the film, then Notebook is already a hit. With kids in the narrative, the plot has ample opportunities to include cute and adorable scenes. We hope the makers have made the best use of the opportunity. Zaheer and Pranuntan are good looking and from the promos, it seems they have acted well in the film as well. So, there is no reason you should miss out on this one.